Preparing for Seder night by studying the text of the Haggadah is a mitzvah, in order to understand every aspect of the Seder (Sidur Yaavets). Moreover, "every man who knows how to study is worthy of praise if he strives to find details in the Torah concerning the miracles and wonders that took place when he left Egypt" (Yesod veShoresh haAvoda). It is also advisable to have one's children sleep during the day before the Seder so that they are attentive to the teachings of the Haggadah. Likewise, adults should strive to be fresh and ready for the night of the Seder, so that they are not disturbed by hunger or fatigue (Pele Yoetz). 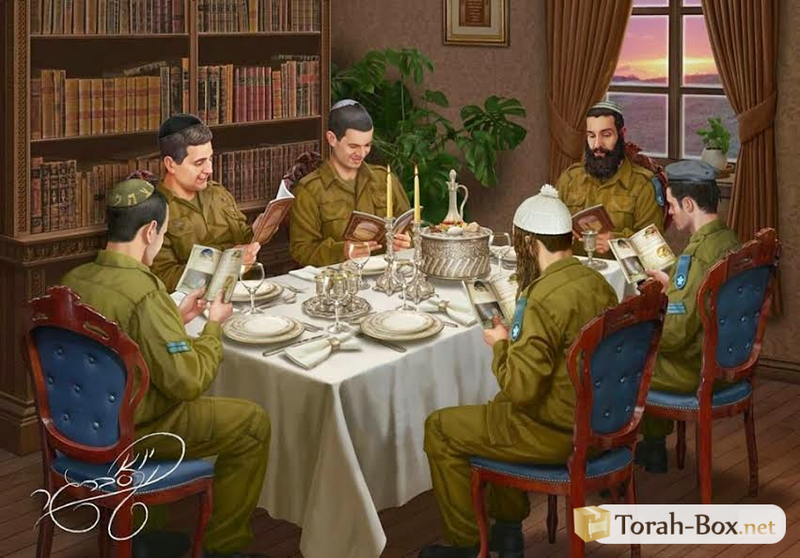 The table and all the preparations must be arranged properly before nightfall so that the evening of the Seder can begin immediately after returning from the synagogue (Shulchan Aruch 672). The Seder Plate is a large dish on which all the necessary foods that will be needed during the evening are placed. Different customs exist as to the order of this plate. The plate should be prepared before sunset on Erev Pesach. Other opinions, however, recommend to prepare it after dark, when returning from the synagogue. Three Matzot should be prepared on the plate. In North African communities, it is customary to punch a hole in the Matzot according to their level on the plate: one hole for the first, two for the second and three for the last. For the Seder, a pleasant wine should be used, preferably red wine, to remind us of the blood of the infants that Pharaoh killed and his bathes in their blood. However, if a white wine is of better quality than red, one may use it. (Shulchan Aruch). In addition, if one wants to color the white wine by mixing it with red wine, this should preferably be done before the festival begins. Those who find it difficult to drink wine may choose to drink grape juice. Each person at the Seder should have an unchipped cup, and a silver goblet is preferable (Kaf ha'Chaim). These goblets should be rinsed before use. They should contain at least a “reviit” (a quarter) of wine, and they should not be too big because, according to some opinions, one must drink most of the cup that one uses, regardless of a rebbit. A rebbit corresponds to 86 grams of liquid according to Rav Chaim Nae, and to 150 grams according to the Chazon Ish. If one drink less than these measures, one has not fulfilled his duty and must drink an extra glass. Children who have reached "the age of religious education" (between 5 and 7 years old according to different opinions) should have to have their own cup containing a rebbit. Many use lettuce for bitter herbs. Nevertheless, care should be taken to clean it properly and to check that there are no insects. Indeed, some insects have color almost identical to that of lettuce, and one can thus only spot them upon careful examination. If one did not check the leaves before the festival, one can do so during the Seder, taking care however to remove any insects along with a piece of lettuce. Others have the custom to use horseradish for bitter herbs. Two quantities of “Kezayit” (a measure that we will discuss later) of bitter herbs should be prepared for each person at the Seder. For Karpass, everyone should take a vegetable according to his custom: celery, parsley, potato or radish. When the night of the Seder falls on Shabbat, salt water should be prepared the day before Shabbat. If one forgot, one can prepare it in small quantities, by preparing it in an unusual way (Shinui). But when the Seder falls on a weekday, the majority of decision-makers agree that salt water can be prepared even during the festival (though some opinions are stricter, requiring that even on a weekday, the water should be poured first and then the salt). For Charoset, it is customary to use fruits to which the Jewish people are compared, such as apples, figs, walnuts, pomegranates, and almonds. Spices such as cumin are added to this mixture to recall the mortar used by our ancestors in Egypt to form cement. Red wine or vinegar is also added to give a compact and thick consistency like cement (Rama). Jews from Iraq and Libya usually make Charoset with fruits that hung in the Sukkah. Two cooked foods should be placed on the Seder table. The first - usually the forearm of a lamb or chicken to commemorate the Pesach sacrifice, and the second - usually an egg - is placed in remembrance of the Chagiga sacrifice. Many Sephardi communities have the custom of toasting the forearms and simply cooking the egg; other customs grill these two foods. The forearm of the chicken corresponds to the paw of the chicken, but many use the wings of the chicken, for its shape is similar to the forearm. The bone must be at least partially covered with meat. It should be grilled directly, without having been previously cooked (Vayaged Moshe). Care should be taken not to say, "Grill the Pesach meat" – which would be to sanctify the meat. The "festival" should be evoked rather than the offering. The Ashkenazi custom is to wear a "Kittel" [long white tunic] during the night of the Seder, as a sign of freedom. This garment - similar to the mortuary shroud - also recalls the day of death, and thus prevents the joy of deliverance from prevailing over reason (Taz). You cannot go to the bathroom wearing a "Kittel" (Shulchan Shlomo). In Moroccan communities, some also wear white clothing on the night of the Seder. Almonds and various candies are placed on the Seder table to capture the children's attention (Shulchan Aruch). It is customary to distribute them at the beginning of the evening (Yaavets). There is a widespread custom to place a large goblet in the middle of the table in honor of the prophet Eliyahu. The piece of Matza called the Afikoman is placed in a bag or a pouch. The custom is to prepare a pillow for each guest, on which he can learn during the evening. 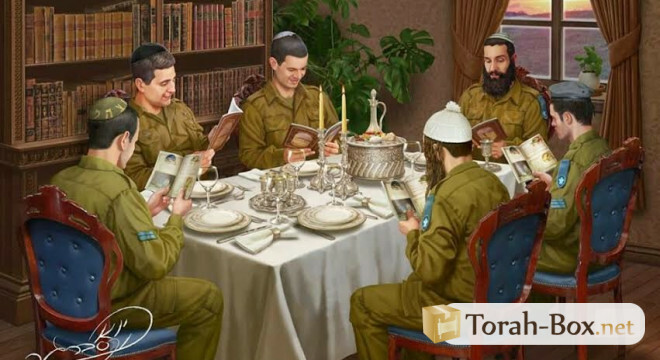 On Seder night, everyone is required to perform five different mitzvot, two according to the Torah and three are Rabbinical precept. 2. Recount the Haggadah: The Torah requires everyone to remind themselves and to tell their children the story of the coming out of Egypt. 3. Consume bitter herbs: our Sages established that even after the destruction of the Temple, we continue to eat bitter herbs the night of the Seder. 4. The four cups of wine: Our Rabbis commanded us to drink four cups of wine according to the quantities mentioned above. 5. Eat Charoset: Our Sages also commanded us to eat Charoset on Seder night. These five obligations apply to men, women, and children from the "the age of education" (Shulchan Aruch). « The Study of Guemara Changed My Life! Halacha Time Class - Sunday March 10th, 2019 (length: 0 minute) given by Rav Shlomo COHEN. 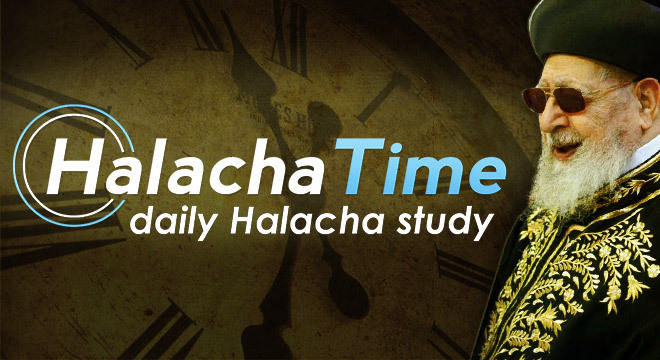 Halacha Time Class - Thursday March 7th, 2019 (length: 5 minutes) given by Rav Shlomo COHEN. The Study of Guemara Changed My Life! Dr. Eli Beneliezer, a renowned researcher and educator, is responsible for selecting and training Israel’s most talented pupils. 6-minute video class given by Rav Avi GROSSMAN. The Haftara: Who? When? How? Antiochus, the Greek emperor, forbade Jews from reading the Torah on Shabbat, so our Sages instituted reading a chapter of the Book of the Prophets instead, to ensure the Torah would not be forgotten.